2. Select the missing number from the given responses. How many pairs of letters are there in the word "GLOBE" which has as many letters between them in the words as they have between them in the English alphabet? STEM cannot be formed since M is not present in the given word. In a certain code "SYLLABUS" is written as “YLBSSLAU". How would "OSTRICH" be written in that code? 6. If '%' means '×', '×' means '÷', '÷' means '+' and '+' means '–', then 150 × 5 + 10 % 3 ÷ 10 = ? 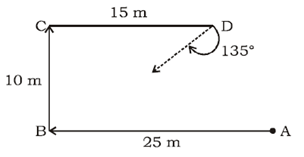 Direction (7-8): Asmitha started walking for distance of 25 m from point A to point B, and then she turned to the right and walked 10 m and reaches point C. She then again turned to the right and walked 15 m to reach D. After this she turned right at an angle of 135° and travels 30 m in southwest direction. 7. Towards which direction Asmitha started her journey? 8. How long she has travelled from point B to reach point D? 9. Find the odd/ word/letters/ number from the given alternatives. 1) A series is given, with one term missing. Choose the correct alternative from the given ones that will complete the series. 2) Select the missing number from the given responses. 3) How many pairs of letters are there in the word “GLOBE” which has as many letters between them in the words as they have between them in the English alphabet? 4) From the given alternatives select the word which cannot be formed using the letters of the given word. 5) In a certain code “SYLLABUS” is written as “YLBSSLAU”. How would “OSTRICH” be written in that code? 6) If ‘%’ means ‘×’, ‘×’ means ‘÷’, ‘÷’ means ‘+’ and ‘+’ means ‘–’, then 150 × 5 + 10 % 3 ÷ 10 = ? 7) Towards which direction Asmitha started her journey? 8) How long she has travelled from point B to reach point D? 9) Find the odd/ word/letters/ number from the given alternatives.